Due to the increasingly unreliable air transportation available for Volunteers serving on outer islands in Kiribati, Peace Corps Director Ron Tschetter decided to reduce the current Peace Corps program in Kiribati. Air Kiribati, the country’s only domestic airline, is operated by the Government of Kiribati, and is unable to provide adequate service to the Volunteers. 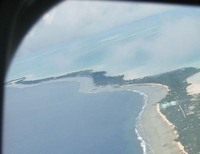 Air Kiribati has made only one plane available since April 2006, to provide services to the outer islands. This plane was grounded for two months, February and March 2007, and has been limited to providing intermittent service since resuming flights on April 2, 2007. Based on Director Tschetter’s decision, the 13 Volunteers on the outer-most islands, with no regular boat service, were either moved to available islands closer to the capital, transferred to other posts, or offered interrupted service. The 15 Trainees who arrived in February departed post (as of April 3, 2007) and either transferred to other posts or were offered interrupted service, due to the limited capacity of Tarawa and the closer islands to absorb additional Volunteers. In addition, the August 2007 input of 17 Health Trainees was cancelled. Peace Corps will be monitoring the situation and has established indicators for evaluating the adequacy of air transportation services to outer islands in Kiribati that will be used to determine the future of the Peace Corps program in Kiribati. Volunteers are currently assigned to placements in 9 of 17 islands of the Gilbert group and the Peace Corps office is located on the capital island of Tarawa. Currently, there are a total of 19 Volunteers. Peace Corps Kiribati has previously had as many as 45 Volunteers in country at any given time. The Peace Corps presence in The Republic of Kiribati began in 1973 and in the ensuing 33 years nearly 500 PCVs have served there. Current Volunteer primary assignments are in two projects: education and health and community development. Assignments also include primary and secondary projects in other development sectors such as: business education, environmental education, disabilities awareness, community and youth development and water and sanitation. Read more. Read more about Peace Corps Kiribati.